All you need to get started is some fusable fleece, a pretty print, a button, a hair tie, and one of those cardboard coffee cup sleeves from your neighborhood Starbucks (just the thought of someone reading this blog not having a neighborhood Starbucks makes me shutter! What ever would I do?!?!). 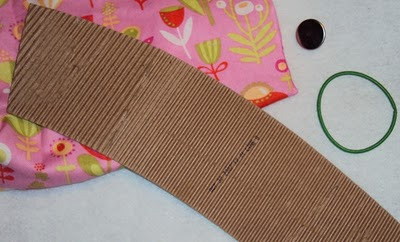 Okay so once you've gathered your supplies, just un-stick the cardboard sleeve so you can use it as a template to cut the print and fusable fleece. Fuse the fleece and print fabric together and top stitch all the way around, catching the hair tie at one end (I back stitched over the hair tie just to make sure it was secure). 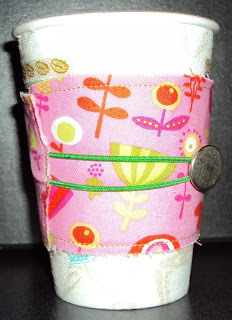 Fit the sleeve around a coffee cup and mark the placement for a button. Sew your button on and embroider an initial if you'd like. When I bought the Starbucks gift cards I asked them for iced coffee tall cups. 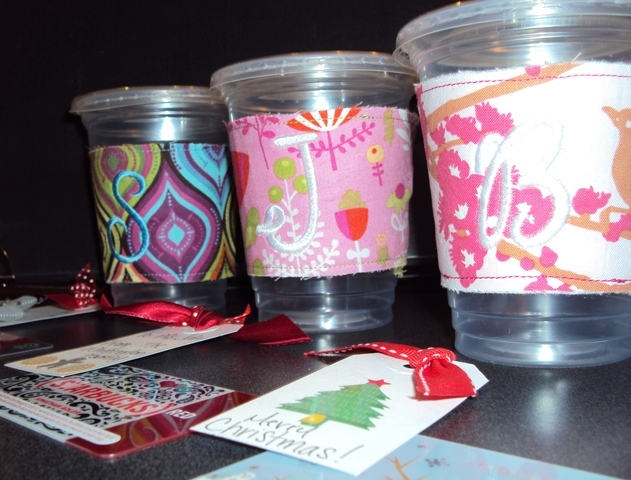 I put the gift card & a little tag with a note in the cup and put the sleeve on the cup. Oh you lucky lucky Floridians, Atomic is coming! Atomic Holiday Bazaar is the best thing going for unique handmade goodness and it's this weekend in Sarasota! I'll be at the Saturday day show, so come by to say hello and pick up an Elle Belle sling (I'm debuting new embroidery designs!) for the new Mommy or Mommy-to-be on your Christmas list! 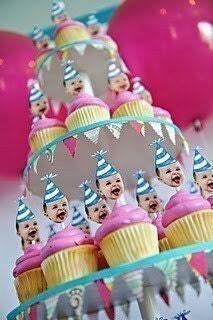 If you let me know you follow my blog and can tell me what my last post was about I'll have a sweet treat for you. I'm thinking pocket peeper stockings are on my girl's Christmas list's this year! The Crafty Hag's mini notes would be the perfect addition to gifts this year! I always drool over the Sew It's For You sushi embroidery designs! Boogie Bead has so much more than just beads... you can check out her Boogie Baby goodies at Atomic! You'll find great stuff even for the guys on your list, like Patrick's amazing wooden pens! Don't miss Atomic, it's the best place to finish up your Christmas shopping! The parents at Elle's school take turns bringing in snacks for the kids for the week. So a couple times during the school year, we have to come up with a little snack to pack for 18 kids. This week was Elle's first snack week. I thought it would be fun to make our snacks sort of interactive/hands on... that is the Montessori way after all. We did a couple simple things like applesauce with a few toppings to choose from and ants on a log (celery with almond butter... sheesh what's up with kids and peanut alergies?!?... and raisens) but we ended the week with Elle's favorite - SUSHI! Let me just take this second to say how happy it makes me that Elle loves sushi as much as I do. Okay so, clearly I could not send "real" sushi to school for Elle's classmates... I think the teachers already have an idea about how crazy I am, but that would erase any doubt! We opted for fruit sushi. I saw this idea on a bento blog and I would love to give credit to the genius Mom who thought of this... if it was you, please speak up. 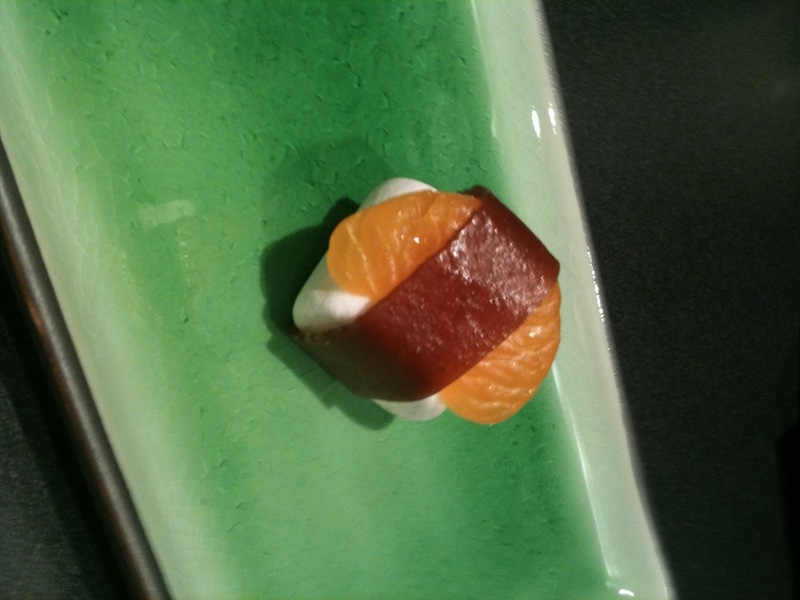 A marshmallow "rice", with a mandarin orange "shrimp" on top, wrapped in fruit leather "seaweed" (I shop the health food section at Sweet Bay to get all natural made from fruit puree fruit leather) has got to be the cutest snack ever. Dontcha think? !